Once there were twin sisters. Lina, who spent more time indoors, had hair of red-gold. Irina, who spent more time outdoors, had hair of golden-red. One day when they were young, the sisters went walking in a nearby park. They found two birds, each with a broken leg. “One for each of us,” said Lina, and they took them home and nursed them back to health. After a while, the birds’ legs were mostly healed. And she took the bird to the woods and released it, and never saw it again. So she put it in a cage, safe on a shelf. The two sisters grew into women, and went off to seek their fortunes. When they'd found their fortunes, they moved into two houses, side by side on the edge of town. Lina had sought a large fortune, and she had a large house with a beautiful garden. Irina had sought a small fortune, and she lived in a little cottage near the woods. As the years passed, the sisters found more birds in need of help. Lina kept hers in beautifully wrought silver cages. Her birds were safe and healthy, and her house was filled with color and birdsong. Irina continued to let her birds go once they were as healed as they could be. Her house was quiet and dark. The only bird in her home was a cuckoo clock on the wall. She led Lina out the back door and along the path into the forest. The forest was dense and dark, and Lina felt nervous. She hadn’t been there in many years. Eventually, they reached a clearing. It was very still and quiet. Irina whistled a short but complex little tune. 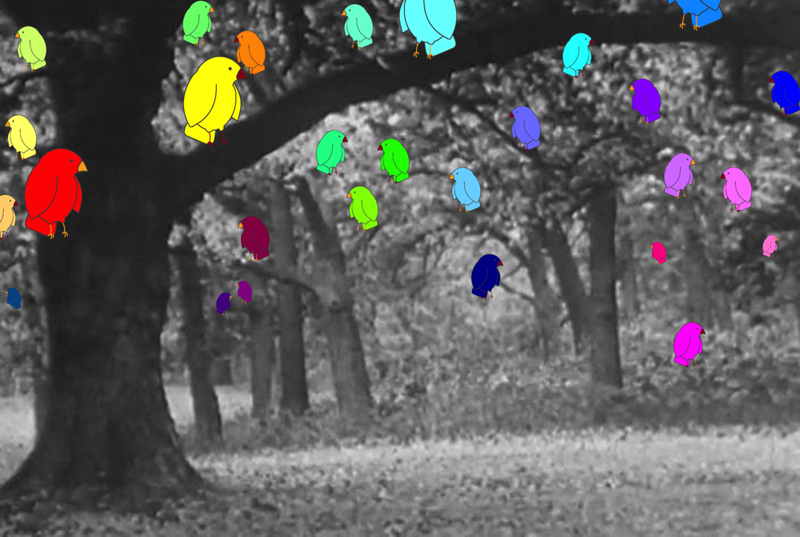 Suddenly, the trees were filled with birds. Dozens of birds, hundreds of birds! Many more birds than Lina could fit in her whole house. She stared at them in wonder. “Are these the birds you rescued?” Lina asked. The two sisters stood in the clearing, watching and listening. As the years went by, things mostly continued the same way. Lina kept most of her birds. Irina let most of hers go. But every once and a while, Lina released a bird that she thought was strong and healthy enough to go off on its own. And every once and a while, Irina found a bird that she thought would never really recover, and she’d bring it to Lina. When they died, they were buried in two graves, side-by-side. The townspeople came and took Lina’s birds, each to a different home, where they lived out the rest of their lives in comfort. From Lina’s grave grew an elegant red oak, and from Irina’s grave grew a wild and thorny yellow rose. And wild birds fill their branches with song and color to this very day.